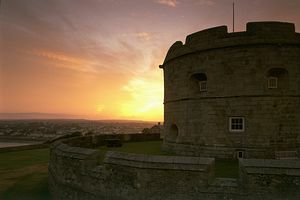 Discover Cornwall's greatest fortress, journey through 450 years of history from Tudor times to World War II and discover the wartime secrets of Pendennis Castle. Go back in time, explore the hands-on Discovery Centre, see a Tudor gun deck in action and experience the sights and sounds of battle. Find out what it was like to be a garrison soldier at the turn of the last century. In the World-War-II Observation Post you'll feel the tension as the alert sounds, warning of an enemy attack. Then descend through secret underground tunnels to the big guns of Half Moon battery and take a guided tour of the underground magazines. Visitors can watch the Noonday Gun firing daily throughout July and August. With its magnificent views of Falmouth and the estuary, Pendennis Castle is a fascinating day out for all the family whatever the weather. On Pendennis headland, 1 mile SE of Falmouth town centre. Falmouth Docks Station ½ mile. Located on the south-west coast path.